The testing rig available at CNR ITAE allows testing thermal energy storages employing PCM or hybrid latent/sensible technology. 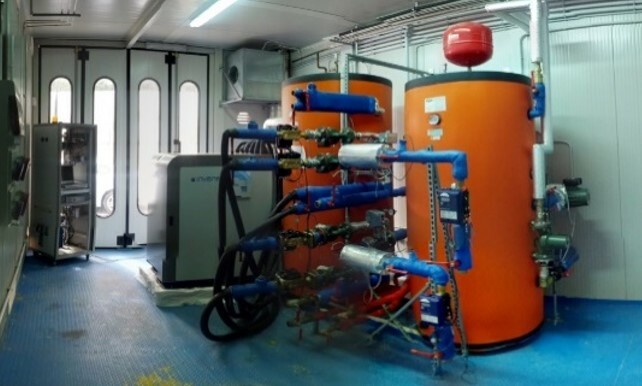 The thermal energy is provided by a 24 kW electric boiler, connected to a buffer storage to guarantee a quasi-constant inlet to the storage under testing. The charge is accomplished by directly connecting the storage under testing with the buffer. Instead, to obtain a settable discharging temperature, a motorised 3-way mixing valve (V3) and a plate heat exchanger (HEX2) are employed: in the HEX2, the water from the buffer is cooled down with tap water. By means of a PID algorithm, the 3-way valve controls the inlet to the storage under testing by mixing the streams from the buffer and the plate HEX. A bypass between inlet and outlet pipes that can be activated through manual deviating valves has also been installed to realise a pre-conditioning of the buffer. All the hydraulic pipes are thermally insulated. The management of the rig and the recording of the main parameters are implemented in a software realised in LabVIEW® environment. For the measure of temperatures, class A thermocouples are used, while a magnetic flow meter MagView MVM-040-PA with ±1% FS is used for the determination of the mass flow rate of the HTF.